Mariana Pussacq dyes fabrics naturally for her undertaking, Casa Almacén. It was a rainy and chilly evening when we met Mariana Pussacq at a café in Buenos Aires. 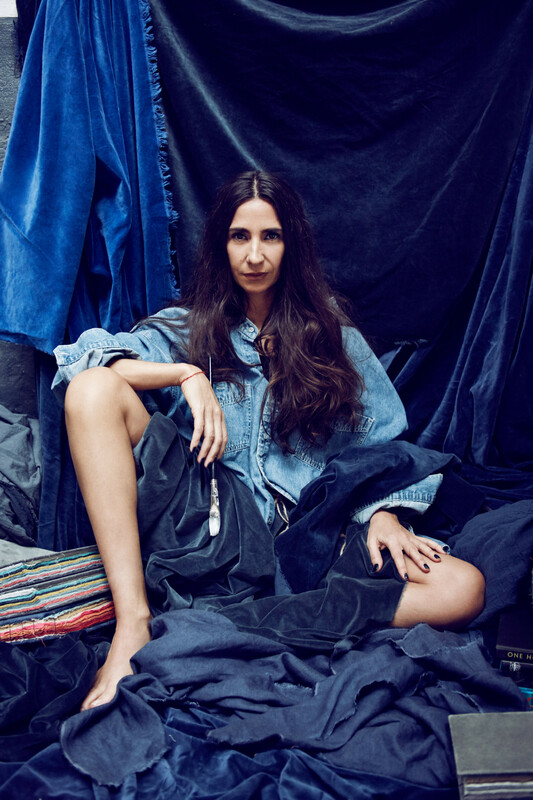 She is the founder of Casa Almacén, a company dedicated to processing and naturally dyeing fabrics without industrialization. Its headquarters are located in a town called Villa Flandria, in Luján, a Buenos Aires province. Pussacq is an architect and artist, who has created a palette of more than 101 colours in her laboratory. 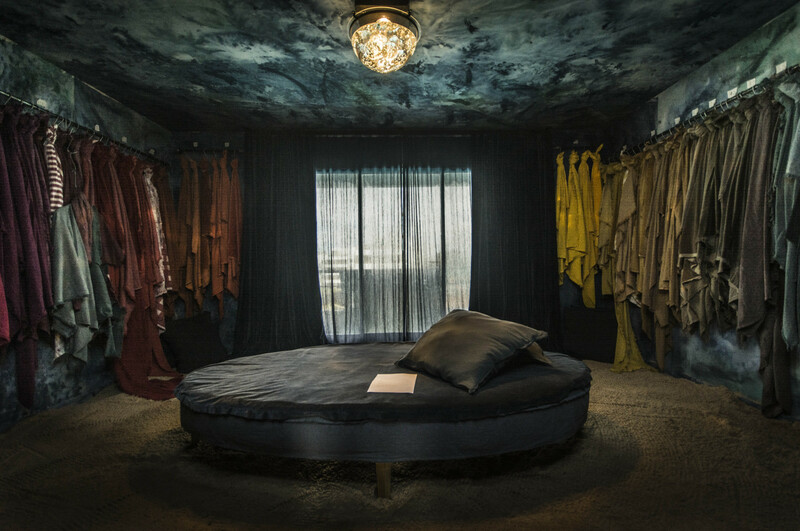 Her artistic team uses Indian and English pigments to hand-paint pure cotton fabrics (such as velvet, linen, panama, canvas and muslin), which are exclusively woven for Casa Almacén. As a result of the creative process and artisanal development, this undertaking offers high quality cloths with special textures and colours. As it is said on their website, their products are meant to be imbibed with “the essence of nature and an unique personal warmth that can be actually sensed”. 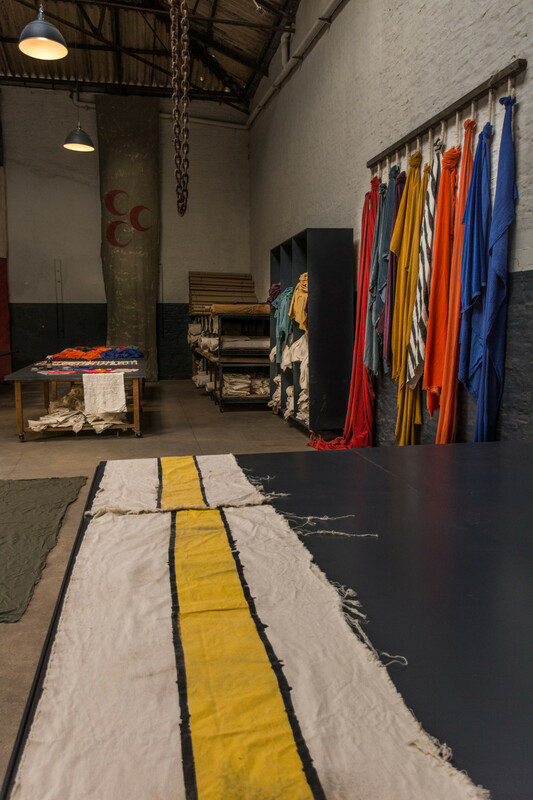 Pussacq applies the textiles in interior and clothing design, as well as uses them for artistic performances. The value of artisanal work, its uniqueness and emotional print, as well as excellency in results are the guidelines of the company. In particular, the principles that rule the clothing line are that each garment is meant to be unisex, timeless and felt as a second skin. Consequently, art, fashion and decoration are harmoniously balanced in this project, with a distinctive cozy style. It was rather late in the evening when we met to talk. Mariana wore her own creations; wrapped in, with a pair of knitted mittens, a look certainly suitable for the cold autumn. She pulled a collection of samples out of paper bags, which could be described as handcrafted notebooks with rainbows inside, and we had a warm and interesting conversation over a cup of coffee. Image from another artistic performance series, which is called “Puertas” (Doors). Actually, I’ve been an artist my whole life. I used to draw as a kid. I never studied art formally but I’ve drawn and painted since I was nine years old. That was my natural way of expression. I went to school, sat in the last seat of the classroom and all I did was listen to the teacher and draw. I have the skill to do several things at the same time and have done it all my life. And I always draw. I can be on the phone talking and drawing at the same time. I could have studied Fine Arts, but chose architecture instead. In fact, I went walking ten blocks to and from my grandmother’s home when I was a kid. Then, when I came back home, I drew the floors of houses I saw and liked. The entire blueprint of a floor. I believed this was an influence from the fact that all my relatives on my father’s side are architects or engineers and they all have created or invented something. When it was time to enter college, my mother told me that architecture was a career that would allow me to understand and do a lot of things and I took her advice. Nevertheless, I have always worked in interior design. I have only built from scratch my own house and made a few more reforms. Why haven’t you practised as an architect? I don’t enjoy just building up walls. For me, a house is a home; it’s your place of support. Your home is really important as well as the objects you can find inside. And it’s all related to textures. As a space of support, it should be soft and pleasant. So, I decided to work in interior design but when it came to go searching for fabrics I didn’t like anything or I liked them but I had seen it in every house, which seems impersonal to me. You could see the same pattern in four different houses, with several uses. I thought it didn’t fulfil me selecting these cloths for a setting or a house. Consequently, I started to develop my own colours. I cut whatever I saw and liked: a piece of an old t-shirt, photographs, everything, and used it as inspiration. Initially, I worked in a laboratory because each colour has a specific formula. Soon after, I had created fifty colours and I used them exclusively for myself. It was crazy. What were Casa Almacén’s origins? In 2012 some decorator friends started asking if I could dye their fabrics and I replied “ok, let’s open the game”. I had kept them as my treasure because they were “my colours” and I had used them exclusively for my decoration. Then, the moment came when I thought I should be sharing them. By that time I had reached a spiritual phase of introspection that helped me to learn a lot about sharing. As an only child, it was an enormous personal growth to be able to say “I can’t keep this to myself”. As a result, I started to develop fabrics and colours for people who requested it and I also offered my services within my acquaintances. Our first business meeting was with Silvina Descole, an Argentinean architect that was participating in Casa Foa at that time. We made some colours and exotic mixes for it and it turned out to be great. At the same moment, we had already met Pablo Chiappori and we presented our own hanger at Paul Deco with colours they used. It began to grow but, simultaneously, I was still working in interior design and architecture because my call was to transform spaces. Though, at some level, working on a piece of fabric is to transform it: you have a plain or raw cloth that says nothing and it is hard. Then, you dye it, process it and maybe wrinkle it. This alteration also has to do with art and architecture. That is why I figured out that it was all connected in some way, afterwards. I went from walls, to furniture and finally, clothes. I felt like it was all getting lighter. How did you end up at the factory? The year we started Casa Almacén, 2012, was incredible because we received lots of orders. I had taught an employee how to dye fabrics using my formulas, based on my ideas. This textile worker was used to dyeing cloth in an industrial way, which means that the colour result must be uniform or smooth. Therefore, if this doesn’t happen, he thinks it has an imperfection, a flaw. And my way of dyeing wasn’t known in Argentina, so it was kind of weird for him. Anyway, he was an extremely calm person and had his own working times, so I realised that we weren’t fit for the challenge. If I wanted to keep growing and meet the demand I couldn’t afford to spend a month and a half on each order, because we were working upon request of our clients. So, I decided to set up a factory, not only because of the volume of orders; but because I needed to give higher professional status to this undertaking. The way I was working didn’t fully convince me because I didn’t feel the place as my own and couldn’t do much more. So, I started looking for facilities and it was really hard since I didn’t like the places that I found, or they were located in awful places. And I had to pay attention to some requirements. For instance, I work with natural and non-toxic colorants, so I have to deal with inflowing and need industrial drains. Setting named “Velvet Underground” by Casa Almacén. It won the first prize for setting and concept for the category of Showroom/Installation in Estilo Pilar 2016, a local decoration, art and landscape exposition. How did you end up in Luján? I spent four or five months looking for the right place and learning about clearance until a friend of mine told me that Luján was the perfect place for me. I told him he was crazy and that there was no way that I would go there. I decided to explore all my options here and only go to check it out if I had no other choice. As a matter of fact, I had no results whatsoever, I went there and fell hopelessly in love. I couldn’t believe where I had arrived. The factory was a cotton plant from 1920 with impeccable English architecture structure. And, on top of this, it was located in the textile mecca. The original owner was a Belgian called Julio Steverlynck, who had the same exact facilities in his country. During the European crisis he settled in Argentina and created a five hectare factory in the middle of nowhere. Luján has this peculiarity. Its basilica was also built in a deserted area and the city grew around this enormous construction. Personally, I feel this is a magic place. It is commonly called “the capital of faith”. And I believe it because this man built this factory in 1920 with a striking architecture, and two towns were developed around it. It has such a history. In addition to this, the owner offered working and social benefits because he had a profound respect for his workers. For instance, he gave them many leisure hours, which was unprecedented at that time. And they started to play soccer, leading to the creation of a social and sport club named Flandria (after the town). Anyway, as you can see, the factory has a lovely history. Steverlynck died in the 1970’s and, twenty years later, the textile industry was in a collapse. His sons inherited the company but it went bankrupt eventually. The factory remained closed for ten years and was bought and cleaned up. The buyer organised auctions to sell its assets (that’s how my friend found out about the place). He restored the building and put several quarters for rent, turning it into an industrial park. How was your first approach? When I first visited it there was only one quarter available, and it was the sole one with a huge chimney. So, I thought it had lots of mysticism. I repaired its inside and felt a little dubious about it, thinking “Would I be doing it right?”. I set up my space and it was quite a mess, because when you move from one place to another you have a lot of changes in the chemical process: in the water, in the colorant, etc. It was terrible for us. I had hired a consultant to take charge of the dyeing process and went on holidays with my children. And when I came back I saw that none of the colours had been right. Not even one. They all turned out to be wrong and we couldn’t figure out why. I wondered if maybe I had done something wrong, but then I stayed strong and reassured myself that I didn’t. I fired the consultant, put my whole energy into it and got things done properly. Till this day I sit with the factory manager and remember those days when we couldn’t get the colours like we wanted to. We have gone a long way regarding the process and knowledge. I had published an advertisement in a local newspaper and made appointments with the job applicants in the most renowned café in Luján, a traditional place situated across from the main square. I sat there, without knowing the place or anybody at all, and hired the manager, who nowadays is my right-hand man and assists me in the production. The renovated space of Casa Almacén in its factory located in Villa Flandria, Luján. What is Casa Almacén’s main goal? I have wondered many times about why I am doing this. In the beginning, it was meant to open the game and to share what I did with colleagues. However, now I am inclined to believe that the main goal is to pass on a way of life; from working with fabric in an unstructured way, dyed with veins and imperfections on purpose, that maybe seems rusty or worn out. I once had a customer that looked at the cloth and said “No, this is stained”, and I replied “Well, life has stains”. Because if it hasn’t, it might as well be a life made of plastic. If you want perfection, you must do plastic things. Casa Almacén has much of this reflection. It is a concept: relax and stop looking desperately for perfection. It is also related to aesthetics, beauty and the comfortable feeling that you get from your home. At the same time, it is also much more than that, than something beautiful. You can feel it: there’s a lot of love put into these fabrics by all of us; from the lovely person that cuts the fabric to the incredible one that processes it. Each stage of the process is made with love and by hand. There isn’t a single machine involved in this. What is the entire process your fabrics are put through? The fabric enters the facilities and it is measured, gets cut, gets processed and the product assurance team verifies its quality. Finally, the cloth is rolled up (unless it is a minor quantity order, then it gets folded) and delivered. But in any case, the fabric is split up because this is the only way to be able to dye it in an artisanal way. How do you balance the industrial and artisanal process? When I was setting the quarter up, I had designed special washing troughs out of my idea of what was necessary for the dyeing process, without consulting any book or expert. This came from my architectural side, thinking rationally how to take on this specific process. They were developed in stainless steel and they help moving the fabric in the water, but the rest is done by human hand. There’s not an automatic button. Needless to say, if you want to do completely artisanal dyeing, you would have to spend a lot of time stirring a hot pot or cauldron and it would be impossible to work with the volume of meters that I develop. We process approximately six or seven thousand meters a month. It is incredibly huge for a textile artisanal production. Apart from this, to set up the factory out of thin air it was groundbreaking. It was mainly trial and error. I had the washing troughs done and I wasn’t absolutely sure of what I was doing. I didn’t know until I saw it installed. It was “the capital of faith” all over again, to be led by intuition and believe that everything was going to be fine. How do you create your own colours? I have my own laboratory at the factory, where I keep all the colorants and try all combinations. That’s why I have all these colours, because I get carried away and make a million of them. I mix a lot: some have one, two or three colours in their formula. Most of them are compounds of three different colours and some have only one pigment. A lot comes from nature, from flowers. I also cut pieces of different things or I take photographs. Inspiration can come from any place that has nothing to do with anything. There’s a colour inspired by a brick, others by a picture that showed redheaded girls dressed in blue garments. Another one came up from a gold ring because it actually had nothing to do with yellow and it amazed me. What are the difficulties that you may find in the process? Basically, thousands of them. To start with, chemistry is absolutely unforeseeable. We can repeat the colour in many meters with a minor variation, which can happen during the industrial process as well. Nevertheless, the water pH may change a bit, the product you use may have a small variation in its composition of 0.000… and you get a totally different colour. I mean, here the zeros are most valuable. One time, we were making a pink-fuchsia and it was mistakenly made with an extra zero after the comma. As a result, we got a pink similar to grapefruit. That additional zero changed the entire formula. When it comes to the administrative part of the business, I think it is my vulnerable side, because I frankly detest it. And it always comes back to me because of any reason. The truth is that we have a person in the area but, at the end of the day, I keep an eye on everything. I realised that it returns for a reason. Maybe I need to be on top of things on my own and learn from them. Yes, I sell my products abroad, wherever I get orders from. I have sent some fabrics to Paris, Miami, and Chile, amongst others. It doesn’t happen all of the time, but I do this now and then. I am prepared to export because I have a creative side and everything in order (given my experience as an architect), I have means, volume and a factory that works at full capacity for as many hours as it is required. How did you decide to take on clothing design? Oh, everything has to do with everything. I’ve spent a lot of time with clothes since 2012, so I end up with rags on top of me inevitably. However, I have always been in touch with something I call the “rags culture”. I end up joking with people, saying that velvet as rags are extreme (kind of expensive as a cloth). It is a practical thing, something unstructured that goes with my character. When I was a kid I used to wear old clothes from my grandmother, mixed with pieces of several antique fabrics. Another picture from the artistic series “Oceanía Alada”. How would you describe the connection between architecture, interior and clothing design? I feel very strongly that there are several skins in our existence. The first one is your own; the second one is what you wear, because it is your texture of direct containment. A sweater must be soft because it is in direct touch with you. The third skin is your habitat, where your life passes by. So, clothing as the second skin is linked at some level with your habitat, which has to do with architecture and interior design. Apart from this, the fourth skin is society, your community, the nearest place to you. Finally, the last layers of skin are the world and the universe. In other words, it is all the same but it only changes its shapes. It’s a concept, it’s something that I take with me, and that I’m conscious of it since I was very little. This is my way of understanding it, to materialize it and bring it to the people. To put it another way, it is not compatible to have something extremely soft to wear and then eat out of a plastic plate. How do your fabrics, interior design projects and clothes interact in production terms? Velvet Underground, our latest clothing line, was inspired by the submarine world. Its colours have a lot of petroleum tones, in shades of blue and green. I was in the mood to dive into this submarine environment. Actually, I am terrified of scuba diving and, to be honest, I don’t really know it. But I needed to express it anyway. Besides, I designed an installation for Estilo Pilar, where you could be able to enter into a place in depth, almost entirely covered with cloths. The reason behind it was that it is often alleged that all you can hear in the submarine world is the sound of your own heart. There’s absolute silence. And this seems incredible to me. It is a silence that we need so much and that is good for us. Obviously, I continue to do interior design for houses. For instance, right now I’m working on a project that is inspired by Dubai, with Arabian reminiscence. And so, I travel with my imagination there, thinking of the colours and shapes, which will be mostly round and similar to arcades. To sum up, it all depends on the moment, on what I have to do and where I’m standing. Maybe the shape is my source of inspiration or maybe it all comes from the colours first, as an expression of something that I’m going through in that exact moment. 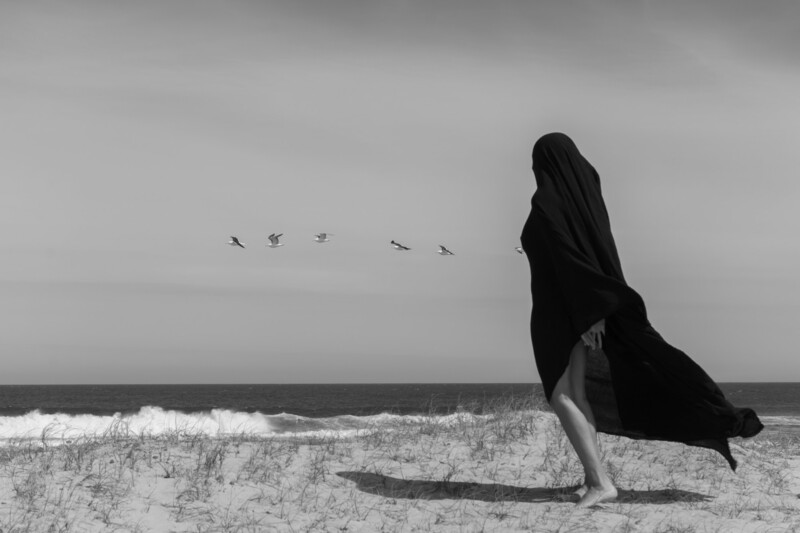 How did you come up with the idea of using your cloths to make artistic performances? It is related to what was previously stated. Since cloths are your second skin, it becomes a part of you. I always end up with fabrics around me. My boyfriend and I travel once in a while to Oceanía del Polonio, in Uruguay. This place has a special, strong and wild energy because there are almost no people and no houses. Maybe in a whole week you come across only one person. I always take cloths with me, maybe because it has a new colour or for any other reason. It isn’t something I think in advance or prepare. We travel with our van full of fabrics. So, we started playing there once. And it felt crazy to expose yourself in front of the nature’s immensity, of the energy from that place and the wind from the ocean. As a result, we could see incredible shapes, so we set up the camera to take some pictures. It was like fusing on a natural being, which is what we truly are. Mariana Pussacq, founder of Casa Almacén. Are you still the only woman in the textile industrial area of Villa Flandria? How is it for you? Yes, I am! It was kind of weird in the beginning because men would look at me and probably think: “uh, this girl comes here to do something that is so strange, What is she going to do?”. People didn’t really take me seriously because they had no idea of who I was and what I wanted to do. And now Casa Almacén has grown a lot and what we do is so great that local people place orders for their own houses. And it is funny. Because of Flandria’s history of being a textile mecca, there are textile workers who have worked in this trade all their lives. And they are asking for my fabrics, whose production they initially couldn’t understand because I worked them in split and with natural dye in an exotic washing trough. Nonetheless, I ended up working in interior design for them. It’s like, at some point, I earned their respect and I’m happy. It was hard at first but it wasn’t so difficult in the long term. I stood up for myself and that was it.